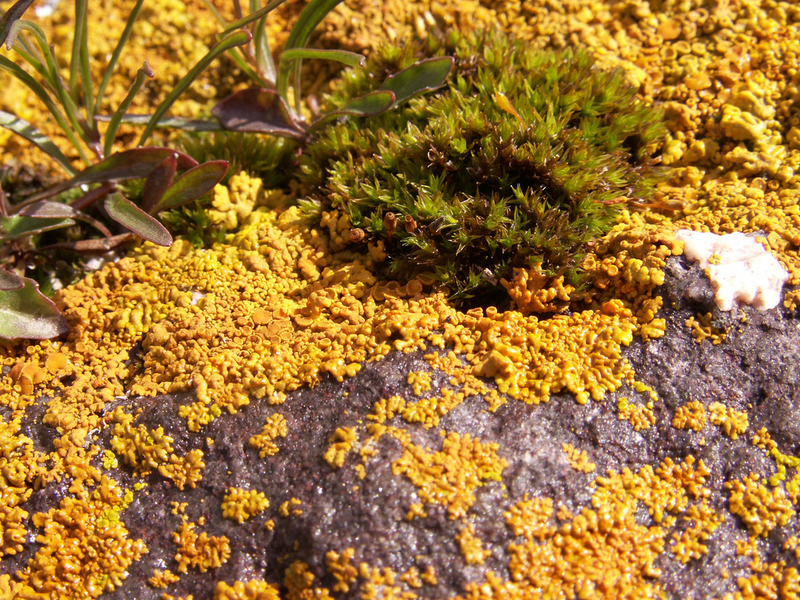 Science Minus Details: What is Lichen? Why is it so cool?? Lichens are composite organisms! Lichens are composed of a fungus along with some sort of photosynthetic organism such as an algae or cyanobacterium. One reason that this is totally insane is that fungi, plants (algae), and bacteria come from three totally different kingdoms of life. Their last common ancestor existed around 2 billion years ago (ref1 ref2), yet somehow they are able to live in harmony! Behold one of the greatest wonders of the natural world!!!! The awesomeness, however, has only begun. It's neat when lichens grow on trees, but its even more neat when they grow on rocks. Lichens come in all shapes, sizes, and colors. The yellow-greenish stuff covering these rocks are lichens. The ability to grow on rocks is a great example of why the organisms that compose lichens need one another. The algae and cyanobacteria are able to photosynthesize. To do that they need light and carbon dioxide, both of which are readily available on any exposed rock surface. However, the other thing they need is water, which is hard to come by on the surface of a rock. Water may be plentiful during rainfall, but rocks do a horrible job of helping that water stick around afterwards. This is where the fungi come in. They are able to form the "body" of the lichen within which the photosynthetic organisms can grow, and these fungal "bodies" help retain the much-needed water. In return, the fungi simply take a share of the tasty sugars the photosynthetic organisms are able to make. What a deal!!! Lichen Formation. The top image shows an algal cell being enveloped by fungal filaments. 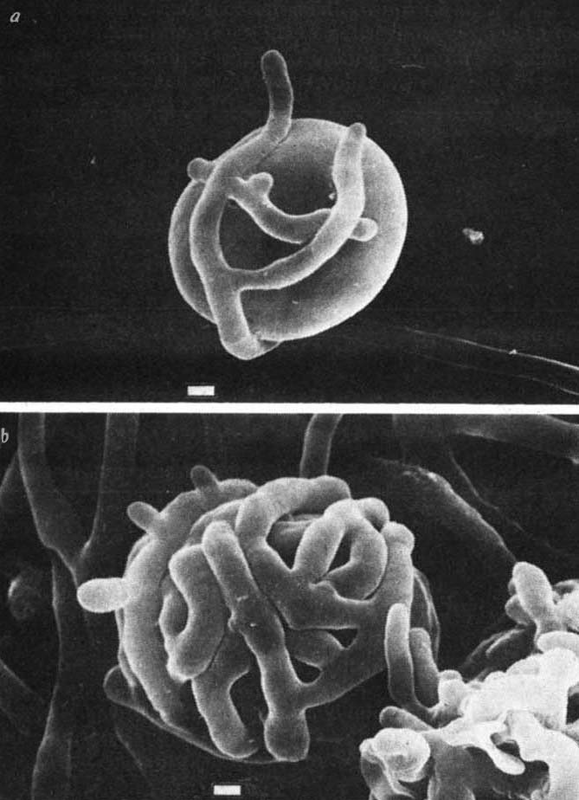 The bottom image shows an algal cell that has been almost completely covered in fungal filaments. images via Ahmadjian & Jacobs. Lichens get even cooler though. On newly exposed rock faces, lichens are often the first organisms to move in, and are known as "pioneer colonizers." During their existence on life's frontier, they actually help create soil (ref)!!! Soil is super-complex, but is composed primarily of minerals and organic (carbon-containing) matter. Lichen help create soil by sticking their numerous little appendages into cracks in the rocks, which speeds up the erosion of those rocks. They also excrete molecules such as oxalic acid that can help dissolve the rocks in a process known as weathering. The above two things contribute to the mineral component of the soon-to-be soil. Lichen contribute the organic matter component by dying, returning their photosynthetically derived bodies to the environment. This organic component performs the function that the lichen once did, helping retain water so it is available between rainfalls. Here's the really crazy part. The presence of soil paves the way for plants to grow and replace the lichen. Plants depend on soil in part to retain water between rainfalls. So, those poor hard-working lichens actually create the conditions for their own destruction! You'd better believe the lichens was there before the plants. image via mamluke. Let's hear it for lichen!!!! So amazing! Maybe the lichens paving the way for other plants isn't such a bad idea - initially they'll get displaced, but once a tree is able to grow they get a much larger surface to live on. Bad in the long term, but awesome in the really long term! wowzers, long term perspective! I like it!! 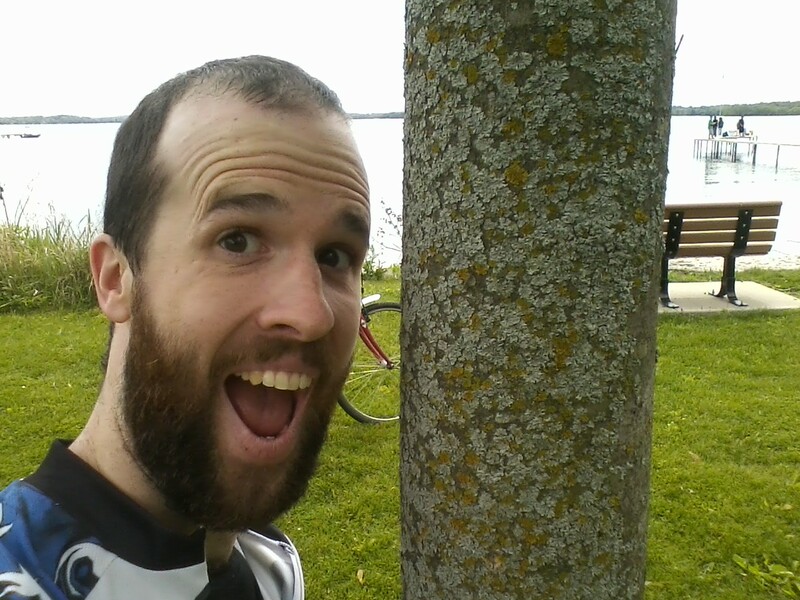 Also, can the organisms that make up the lichen survive by themselves? Many of them can survive by themselves in culture. If I can find the time I'm actually thinking of cooking up another post based around the paper that is linked in that electron microscope image. That paper rules. They take the two species, culture them separately, then mix and watch what happens... seems to have been one of the first papers to establish that lichens were symbiotes. I'm not sure if ALL species that form lichens can live by themselves though... but some certainly can. I learned the meaning of symbiosis through the aforementioned illustrations of Venom/Eddie Brock when I was 12. That is amazing! What an awesome way to introduce the concept! I had not heard of Eddie Brock until just today, so clearly I have some work to do!